Wikimedia Commons has media related to Medlar. The medlar is a tree and the name of the fruit of this tree. 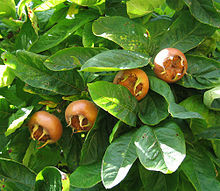 Its Latin name is Mespilus germanicus, or "German medlar", but it is not from Germany. It grows in the Near East and South-Eastern Europe, and the Romans took it to Germany. Near the Caspian Sea, people grew the medlar about three thousand years ago. It came to Greece in about 700 BC and to Rome in about 200 BC. It was an important fruit plant in Roman and medieval times. But by 1600-1700, people started eating other fruits and not the medlar. Today people do not grow it very often. The medlar needs warm summers and mild (not too cold) winters and likes to grow in sunny, dry places. In the best places, the plant can grow up to eight metres tall. The medlar is deciduous: it is not green all year. Usually, it is shorter than a tree. It lives thirty to fifty years, quite a short time. Medlar leaves are dark green, maximum fifteen centimetres long and three centimetres wide. The plant has flowers in late spring. The flowers are white. The red-brown medlar fruits are similar to apples and grow to two to three centimetres. They are very hard and acidic, and we can only eat them after the cold weather makes them soft. This page was last changed on 28 May 2018, at 13:34.